Having a home bar sounds like a luxury, but most homes and most budgets have the potential to include a functional bar. Home beverage and bar stations have a few key, and very basic needs which can be achieved in a number of simple or complex ways. Adding a bar to your home is a great solution for those who entertain often, or anyone who likes having a selection of liquors, wines or beers on hand. Read on for our suggestions for a well-appointed, functional home bar. In this home bar, an L-shaped counter conceals an undercabinet fridge, leaving the cabinets at the back for bottle and glass display. There are generally three elements that all home bars need to be effective and useful: storage space for bottles, a counter for preparing drinks, and a place for your barware. The storage needs of your bar start with a look at the types of drinks you're most likely to keep at home. Each type has a different set of needs. Take some time to inventory what you have according to storage category. What needs refrigeration? Do you need two or more different temperatures (say, one for beer and one for wine?) Do the bottles need to be stored sideways, or away from fluctuating temperatures? Are you going to include other, non-alcoholic beverages? The homeowners for this lower level remodel required storage for several cases of beer at once. Two refrigerators provide the space, while liquors and glassware function as display on the open shelving. If you don't have much of a collection of beverages, and don't foresee that you'll want to start one, then your space needs will be significantly different than if you have a large number of bottles to find a home for. If possible, it might be helpful to put all your bottles together to get a better sense of how much room they require. Also consider if you may be better served with all the items stored in one location, or if you'd prefer to arrange a "long-term" storage spot separate from the main bar. 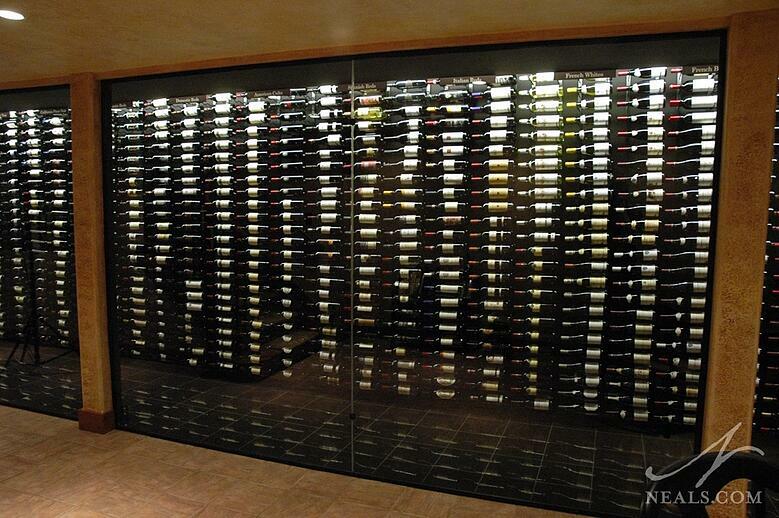 A temperature controlled space in this wine cellar holds a vast collection. Large or small, there's a storage solution for your needs. There are several "off-the-shelf" solutions for bar storage. Temperature-controlled wine coolers come at several price points and varieties. This is also true for beverage fridges for beers and sodas. 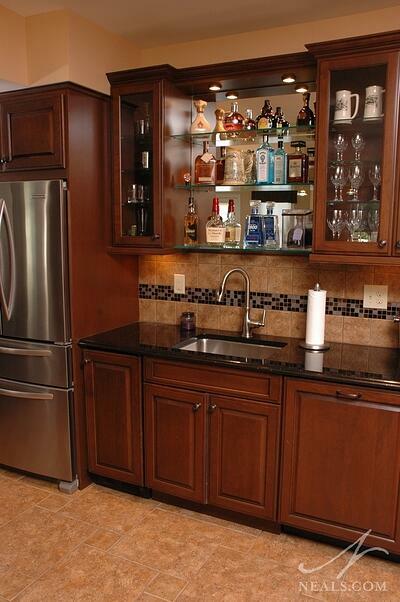 An undercabinet unit is a great option for most home bars. 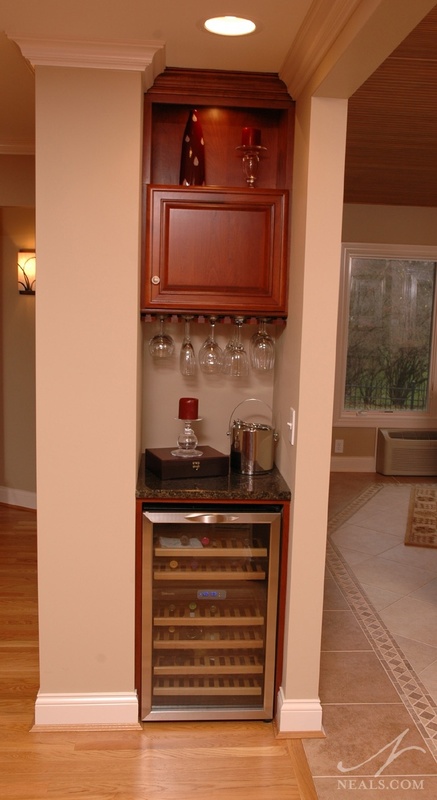 There are also many solutions for horizontal wine storage including standard cabinets that can be included in a custom bar solution, and more unique or stylish options for wall mounted storage. 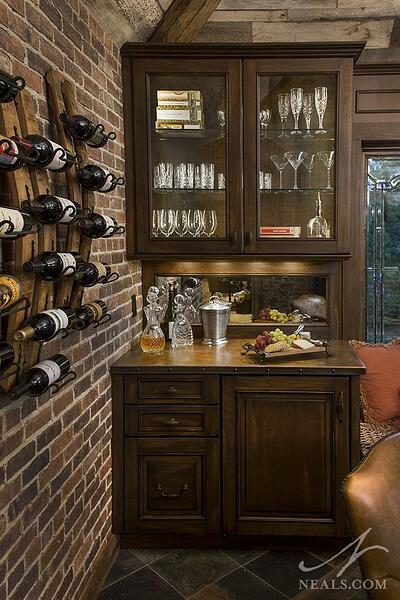 All the components of a functional home bar are in this niche, which is part of a whole house remodel. We're all familiar with the iconic vision of the Old West cowboy sidling up to the counter at the local saloon, so the traditional look of a long bar counter with seating on one side and storage on the other is a classic concept that many homeowners like to see in their home bars. Not every home has that option, though, so it's important to evaluate your space and how you'll use your bar to determine if a seated bar counter is the best choice. A bar counter, in reality, doesn't have to be large, or provide seating. The main reason to have some counter space is to have somewhere to set glasses, open bottles, place an an ice bucket, etc. and a place to work if you're making mixed drinks. 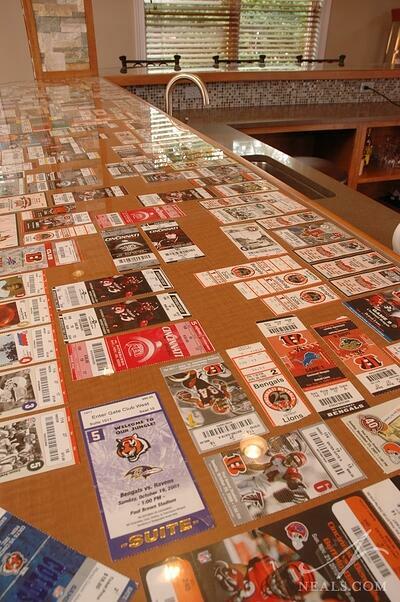 These homeowners used their counter to display ticket stubs to the define the theme of the bar. 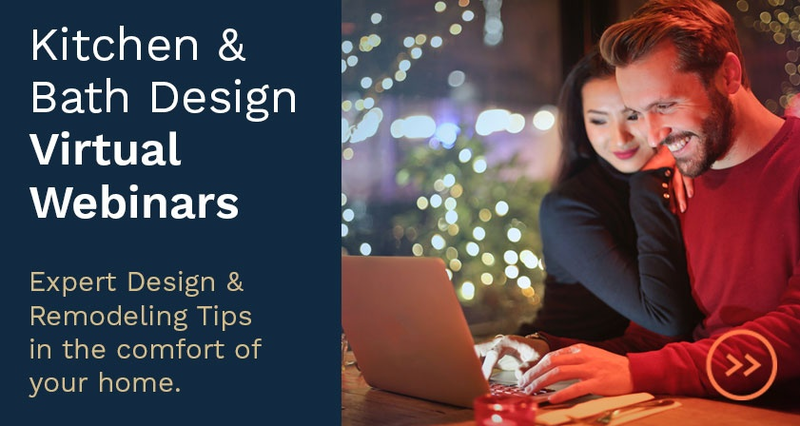 If you have the space for a large bar area, consider the design style. Larger home bars are often great areas to try a different style or to explore a particular look that you love. Can you combine areas around your bar counter to create a larger space for entertaining that feels cohesive and a part of the bar? 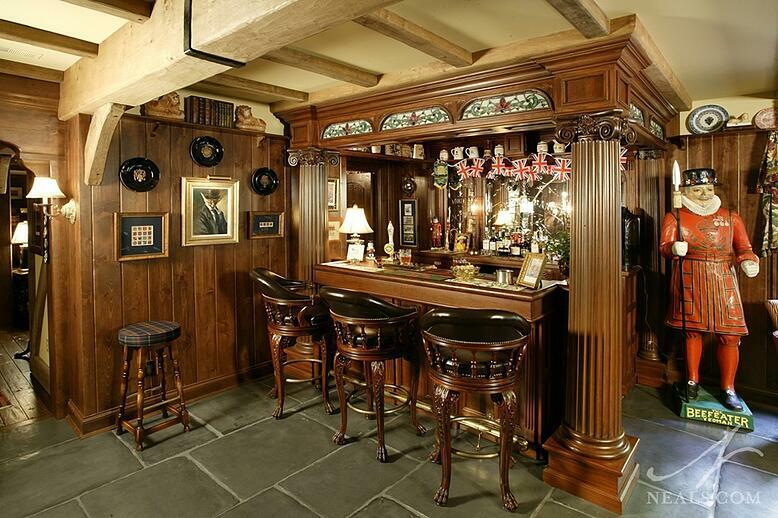 One great example is Neal's award-winning basement remodel in Anderson Township that converted a bare lower level into an English-inspired pub. The jumping point for this space was an authentic, traditional English bar counter. An authentic bar, including seating counter and mirrored back wall, is the cornerstone of this English pub remodel. Do you need your bar to have a sink? 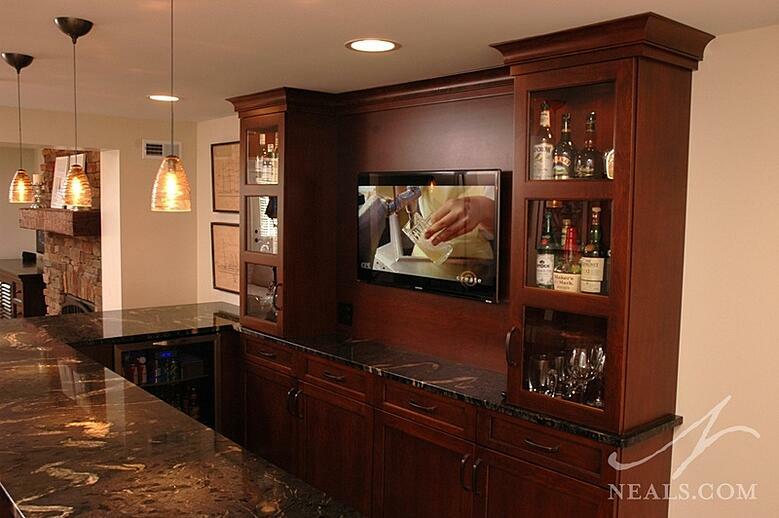 A wet bar is an ideal solution if your bar is located a distance from your kitchen. A sink will require more work and cost to install than just adding a cabinet or fridge, but if it makes the most sense for your needs, then it's an investment worth including. If your bar is larger, or a dedicated space, there may be a good case for outfitting the bar with a dishwasher, microwave or warming drawer, and a full-sized fridge with freezer. This is especially useful when hosting large parties, or if your bar is located in the basement. 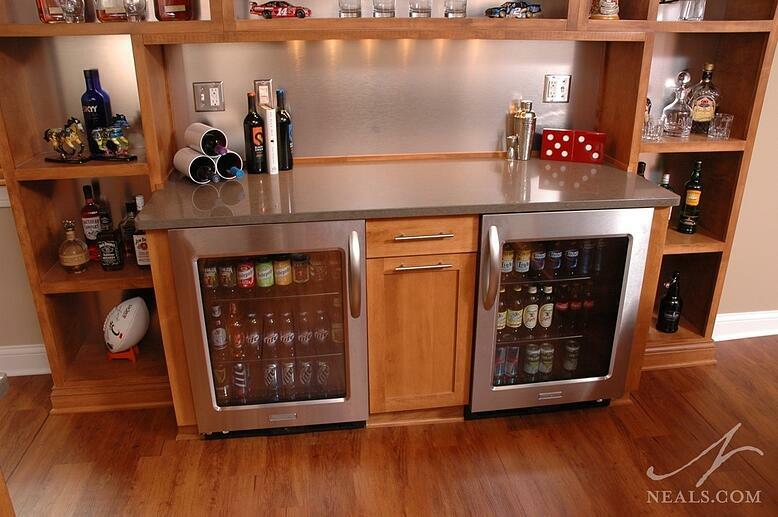 A fridge and dishwasher were included in this basement bar to add convenience so far from the main kitchen. One of the best aesthetic components to a home bar is the sparkling glassware that comes with it. No matter your drink of choice, all adult beverages have a specific drinking vessel made for them. Even having just a few on hand of each of the types you regularly need means that your barware collection can easily rival your beverage collection. All those glasses need a place to call home, and storing them at your bar, rather than somewhere in your kitchen, is a better option for serving drinks efficiently on the fly. Glass-fronted cabinets with interior lighting in this pub room makes this collection of drinkware sparkle. There are so many variations on storage for drinkware that it would be impossible to cover them all here. Let the amount of storage you need steer you in the right direction to start. After that, consider the look you want to go for. Glass-fronted cabinets with interior lighting will show off your glasses, and bring some simple interest to the bar. If you mostly have stemware, consider racks that allow the glasses to hang upside down for a professional looking bar. Open shelving mounted over a distinctive backsplash or wall paper is a great statement maker that also happens to give your drinkware a place.